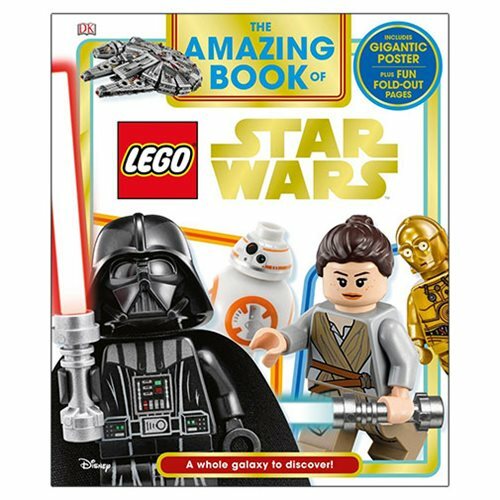 The Amazing Book of LEGO Star Wars Hardcover Book is the perfect first book for any young LEGO Star Wars fan. The Amazing Book of LEGO Star Wars Hardcover Book will help children ages 5 and up explore the amazing LEGO Star Wars universe. From Anakin Skywalker and Yoda to Rey and Kylo Ren, young readers will see their favorite characters and sets brought to life. Fans will be fascinated by the eye-catching designs featuring large, dynamic images of heroes and villains, while key themes are explored using carefully leveled text that will capture their interest. With a mixture of full and half-page fold-outs throughout the book that reveal extra-large images and a fold-out poster at the end, The Amazing Book of LEGO Star Wars is great for young fans. The 48 page book measures about 11 1/10-inches tall x 9 3/10-inches wide. Ages 6-9.